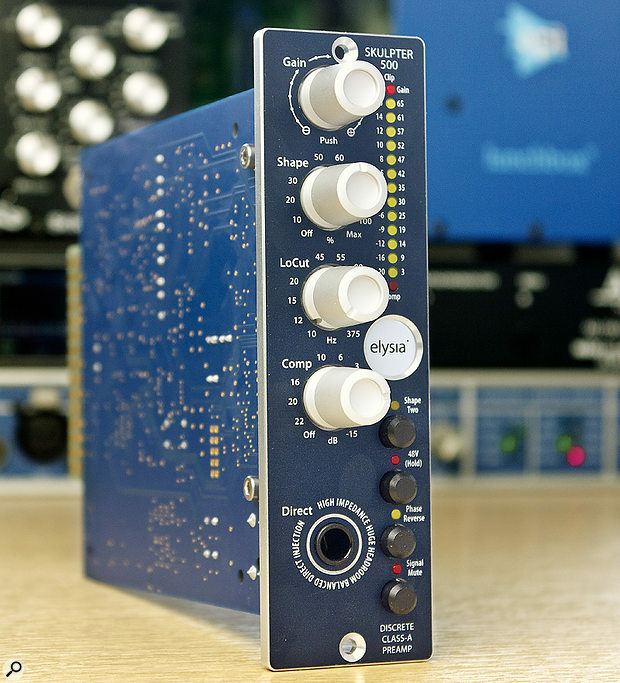 I’ve been interested in the products of German company Elysia ever since I first laid eyes and ears on their wonderful Mpressor, a compressor which was not only beautifully quiet and superbly built, but which boasted a number of controls not found on many hardware compressors — a gain-reduction limiter, for example, and a simple but lovely sounding EQ. 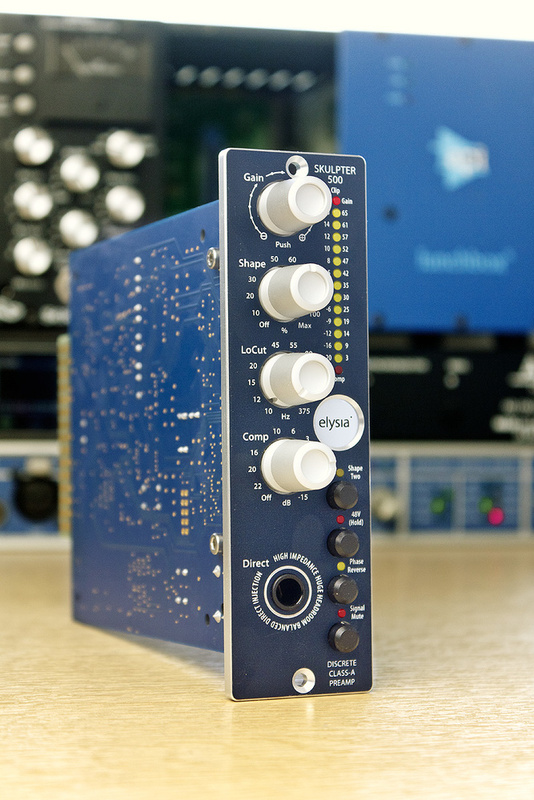 That particular device, like their flagship Alpha mastering compressor, remains a luxury that’s priced beyond the reach of most home-studio owners, but in recent years Elysia have packed similar technology into a range of 500-series modules, all of which have been much more affordable. The latest of these is the Skulpter 500, which is ostensibly a mic preamp, but there’s much more to it than that — in fact, with a sort of preset EQ and saturation processor, an on-board one-knob VCA compressor, and some beautifully executed metering, you could argue that there’s enough here to call it a channel strip. It also accepts mic, line and instrument signals; the JFET high-impedance (1MΩ) DI input on the front-panel input can, like the mic input, accept signals up to +19dBU, and the instrument or line-level sources can be balanced or unbalanced. Working my way down the front panel, the gain knob is a 20-step continuous rotary encoder that operates a series of relays and electronic switches to give you 40 separate steps of 1.5 or 2 dB gain — the total gain range is 3-65 dB, which is plenty for most studio applications. A nice touch is that the last-used gain setting is recalled on startup. The gain encoder doubles up as a push-switch, and this action changes what’s displayed on the adjacent 15-LED meter. By default, the 13 yellow LEDs display the output level, but pushing the encoder displays the amount of input gain you’ve dialled in. The top-most LED of the meter is red, and indicates clipping, glowing brighter the more you overload the circuitry. The bottom-most one is also red and tells you what the compressor is doing — this single LED again glows brighter as more compression is applied. All in all, this multi-function meter is very elegant and easy to read, and a thoughtful use of the limited panel space available in the 500-series format. The next control is labelled Shape, and this is effectively a wet/dry mix control for an EQ and harmonic distortion (saturation) generator. The EQ curve is preset, though there are two ‘shapes’ to choose from, and the amount of saturation is determined by the input level. Shape One, the default, cuts high frequencies via a high-pass filter with a turnover frequency around 4kHz. By blending this EQ curve in with the original, you’re effectively increasing the steepness of the slope. Shape Two, which is selected using the little black Shape Two button, is something I found really addictive, particularly on female vocals, adding an almost tube-like flair, or brightness. The source of that coloration is the combination of a broad EQ bump centred around 4.5kHz and the soft-clipping that results from this boost. Next comes a high-pass filter. Most mic preamps will offer one of these, or perhaps even couple of switchable frequencies for use with different sources. Elysia have gone a helpful step further by offering a variable 12dB/octave filter, complete with its own discrete amplifier. This filter can be set to almost anything (it’s a detented pot, so there are small steps) between 10 and 375 Hz. The final step in the signal chain is the one-knob VCA feedback compressor. The knob, labelled Comp, acts as a variable threshold for the 3:1-ratio, soft-knee processor. Use this on a vocal part, and you’ll be rewarded with the sort of unobtrusive, fairly slow compression that it’s hard to screw up, making it perfect for use while tracking. But there’s actually rather a lot more going on behind the scenes, because the Skulpter 500 employs Elysia’s signature Auto Fast technology, which automatically shortens the compressor’s attack time when it detects strong transients. Also, a clever feature is that the compressor only forms part of the signal chain when it’s applying gain reduction — when there’s no compression, it’s bypassed. The compressor is the easiest thing in the world to use: turn clockwise for more compression, anticlockwise for less. If in doubt, a glance at the single-LED intensity meter quickly informs you what the compressor is doing. There are just a handful of other controls — three buttons below the Shape Two control, which engage 48V phantom power, ‘phase reverse’ (polarity invert), and mute the output while leaving the metering active. It was a refreshing surprise to find a nicely printed, full-colour, pocket-sized, ring-bound manual in the box, rather than the two-sided-sheet that so many manufacturers seem to deem sufficient these days. This lists various technical specifications, as well as displaying the Shape curves in graphic form and offering useful hints about how to get the best results from this device. There’s really very little more to say. In summary, the Skulpter 500 is a wonderfully versatile microphone preamplifier that could be used in all sorts of studio applications, with all manner of mic, line and instrument level sources. It sounds clean and transparent, as a good all-rounder should, but it also boasts some clever and intuitive processing for those times when you want to add a little something extra to the sound. Importantly, experimenting with the processors is really quick and easy; there’s nothing that should get in your way or confuse you if faced with this device for the first time on a busy studio tracking session. Considering all that’s on offer here, the price really is very reasonable. Recommended.